People used to buy products; now they buy experiences. 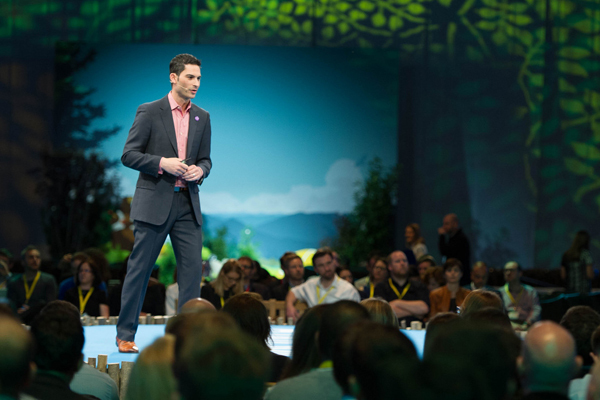 This was one of the key takeaways from Salesforce World Tour 2017, whether your interest was in sales, marketing, service or internal operations. While products are still essential, customers increasingly seek out providers who provide a superior experience. For online shoppers, that superior experience can be as simple as a “predictive sort” function, which automatically sorts a webpage to show items they’re most likely to be interested in first. For buyers of smart home devices, it could be the ability to upload a photo of their current thermostat and receive an instant reply to tell them if the device they’re interested in is compatible. For developers of high-rise office buildings, it’s the reassurance that an engineer will come to fix an elevator at the first sign of trouble, well before it breaks down. That last example is something elevator manufacturer KONE is offering today – and it’s indicative of how mobile, internet of things (IoT) and artificial intelligence (AI) are powering a new kind of service experience. Two sessions at this year's event in London looked at how IoT and AI are set to transform the world of field service. Today, the usual pattern is that when a device like a dishwasher, vending machine or elevator breaks down, it’s up to the customer to notice the breakdown, contact the relevant company and wait for an engineer. Very often, the engineer doesn’t have the right part, tools or knowledge, and has to file a paper-based work order, order the parts (if they know which ones are needed), and reschedule a visit. That can leave the customer without a working machine for days or even weeks. With the Internet of Things and artificial intelligence – both now integral parts of the Salesforce Customer Success Platform – a connected device can sense when something is wrong, automatically open a case in Service Cloud, and request an engineer with the relevant parts and experience. All before the customer notices anything’s gone wrong. The first thing the customer knows is when they receive an SMS or app notification that a visit from a technician has been scheduled – and if that’s not convenient, Salesforce makes it very easy for them to request a more suitable timeslot. What’s more, the engineer has access to Service Cloud via their mobile device, so when they arrive at the job, they can collaborate via Chatter with colleagues for any help needed to repair the machine; file their work order direct from their phone; notify the service centre that their job is complete; and pick up their next assignment. This is intelligent, proactive service – providing a great experience for the customer, preventing downtime at their home or business, and keeping service operations more efficient, too. And it’s not just about making high-touch service visits more efficient. Salesforce also enables “no-touch” field service for customers seeking to fix problems themselves. When a customer asks for help in a brand’s Salesforce-powered community forum, not only can they get advice from other customers, but Salesforce’s Einstein AI software can also intelligently recommend helpful articles, based on the customer’s query. Today, companies like KONE, Coca-Cola, Nest and Centrica are all using Salesforce Service Cloud to enable intelligent, proactive and connected service. These trailblazers are showing how the combination of innovative technology and insight into real customer needs can drive a transformation in field service. On the other side of the service equation, brands are using Salesforce to transform contact centre operations, too. It’s an approach that’s been taken by Coca-Cola’s B2B operation; where sales and service teams collaborate in the Salesforce platform so they’re all equally able to provide advice, recommend products and process orders. In a retail industry panel discussion, the Co-op’s head of customer services, Claire Carroll, said the retailer has used Salesforce to create a single view of the customer that drives upsell and conversions in the contact centre. “Now, we convert 20% of people who call into our food service centre to a membership,” she said, adding that since investing in Salesforce, the volume of trade conducted through the contact centre has increased by 9%, equivalent to an £8m annual uplift. The key is to have a unified view of every customer interaction with the organisation, whether it’s with marketing, service or sales, and whether it’s taken place via email, web, phone, social media, chat, messaging or posts in the community forum. Now with Salesforce Live Message, agents can engage in customer conversations via SMS or Facebook Messenger to create even better service experiences. Today, most brands treat those interactions as separate transactions, said Mark Abramowitz. With the Salesforce Customer Success Platform, they can bring all those individual transactional interactions together to show the customer’s entire conversation with the brand over time. That enables service agents and self-service features to better understand the customer, and provide a better answer in a shorter time. With the application of AI, that process will only become easier – making for a better, more personalised service experience for the customer every time. Check out our Second Annual State of Service report to learn more about the latest customer service trends from around the world.